There were many people enjoying the ice on the Bay of Quinte today: the photo shows some youngsters skating on what was once the log pond beside Mill Street in Deseronto. It brought to mind an advertisement from The Tribune of December 9th, 1892, which was encouraging parents to buy skates from the Anderson and Miller store on Main Street as a Christmas gift for their children. I’m not sure how thrilled their mothers would be at getting “the latest improved Washer and Wringer”, though. If we give cause to blame. At ebb or flood of tide. Of lumber you’d get lost. Behold a nine by nine. When Jamie Stokes they view. Of crafts of every kind. Behold the Grist Mill there! The Burners we will view. For winter work and cheer. You see the Rathbuns’ Crest. 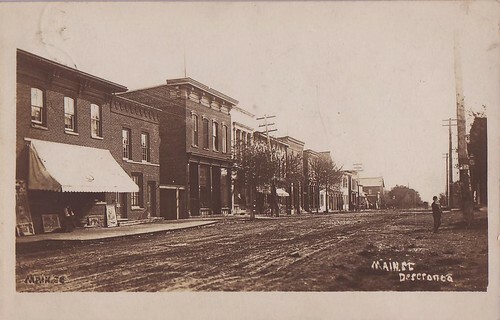 Macintyre died in William Street, Trenton, on December 13th, 1921. His occupation was given as “Filing Clerk, C.N.Ry [Canadian National Railway] Stores”. He had been living at that address for three years before his death. He was, however, buried in Deseronto’s cemetery: an event that also took place, coincidentally, on December the 15th. James Stokes was listed in the 1891 census for Deseronto as ‘wharfinger’: the man in charge of the day-to-day business of the wharf. He was 42 at the time of the census. He died in Toronto on April 4, 1913, aged 64. This was presumably Richard Rayburn, the flour mill manager, according to the 1891 census. The 1891 census lists 41 year-old William D. McRae as “Superintendent, Gas and Chemical Works”. McRae was born in Scotland. The Santa Claus Parade will be taking place on Saturday evening (November 28th) at 6.30 in Deseronto’s Main Street and Rathbun Park. To start getting you into the seasonal spirit, here is an advertisement for the Bay of Quinte Meat Company which appeared in Deseronto’s local newspaper, The Tribune on December 9th, 1892. This store was located in the Baker Block on Main Street, on the route of Saturday’s Parade. This Christmas that has ever been seen in Deseronto, or in fact, in Ontario. We are already booking orders for Turkeys. “Now is your time to do likewise,” and thus be sure of your Christmas dinner before the turkeys see this ad. and strike. Our store on Christmas Eve will be far more worth seeing than any Christmas Tree. Arrange to bring your families to see it, no matter whether you require anything or not. Just come along and have a look, and if it does not make you hungry to see so many nice things ready for the oven it won’t be our fault. Owing to our increased trade, and anticipating an immense rush of thousands of new customers during Christmas week, we are now trying to make arrangements with Mr. Baker to add another hundred feet on to his already fine block. Some of our customers are buying their turkeys now, and eating them too, so that they will not be left when the rush comes. Do not be afraid – we will have enough for all. Only give us your order now and not have to wait, as we were only able to secure the services of a few less than fifteen men to serve you on Dec. 24th. So come one and all and see the great Christmas Fair. A good illustration of the fact that the use of humour in advertising was not a twentieth century invention! We’ve got a group of Women’s Institute members coming to visit Deseronto next week. The Archives won’t be open, as they are coming on a Tuesday, but we have put together a small exhibition for the group to see. They will also be having a look around the town, so we have also made a brief tour guide which pinpoints some of the significant buildings, past and present, including photographs and descriptions. It seems that this might be of interest to other visitors to Deseronto and it is now available to download. Metcalfe Foods had canning factories in Deseronto from 1912, according to a Deseronto Post article published in 1948. The archives has three copies of this photograph of the staff of the firm, taken in the 1930s (either 1932 or 1938, according to notes on the photos). One of the employees pictured here, Floyd Marlin, wrote down many of the names of those pictured and his list is reproduced below. If you are able to fill in any of the gaps, please post a comment or drop the Archives an email. Some of the spellings here are possibly wrong, so please let us know if you spot one that needs correcting. 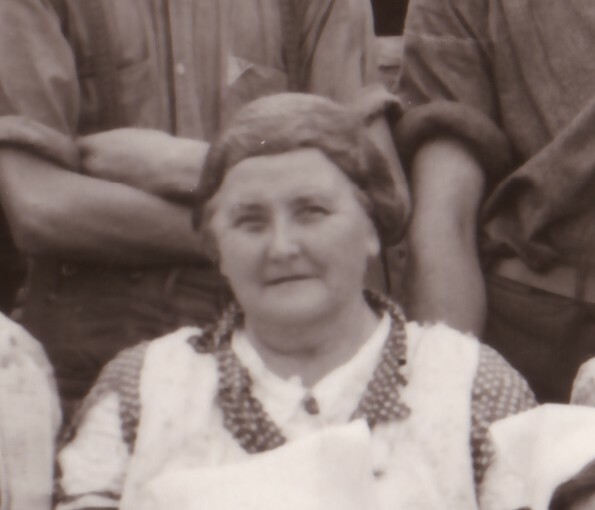 Maude Covert, who also appears in this photograph, lived at the house we featured in an earlier post. 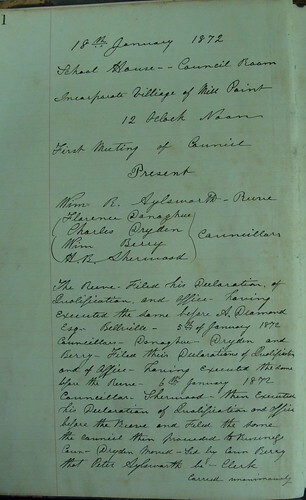 The earliest minutes for the town council of Deseronto (in the days when it was known as Mill Point) show the names of the Reeve and four town councillors. One of the names is that of Florence Donoghue, which was intriguing, as it seemed highly unlikely that a woman could have been a councillor in 1872. The mystery was soon cleared up, as later minutes in the same volume referred to this councillor as “Mr. Donoghue”. Florence, it transpires, was fairly common as a boy’s name in Ireland in the late nineteenth century. In the 1881 census of Canada there were 64 Florences whose place of birth was Ireland. 24 of those were men. Florence Donoghue was born in Ontario, but (as his name suggests) he is listed as being of Irish descent.